Unique senior sessions - be still my beating heart. Kelly asked for something that I’ve been dreaming of doing for a long time. The majority of my high school seniors are excited about having their shoots done in Minneapolis - capturing the skyline, the pretty brick roads of St. Anthony Main, or the gorgeous sunset over Lake Calhoun - Minneapolis has a lot to offer but sometimes it’s fun to mix it up and get outside of the cities. Kelly and I brainstormed about two months before her actual shoot (October dates fill up quickly - make sure to book 3-4 months in advance if you want to be sure to have fall colors in your senior portraits!). 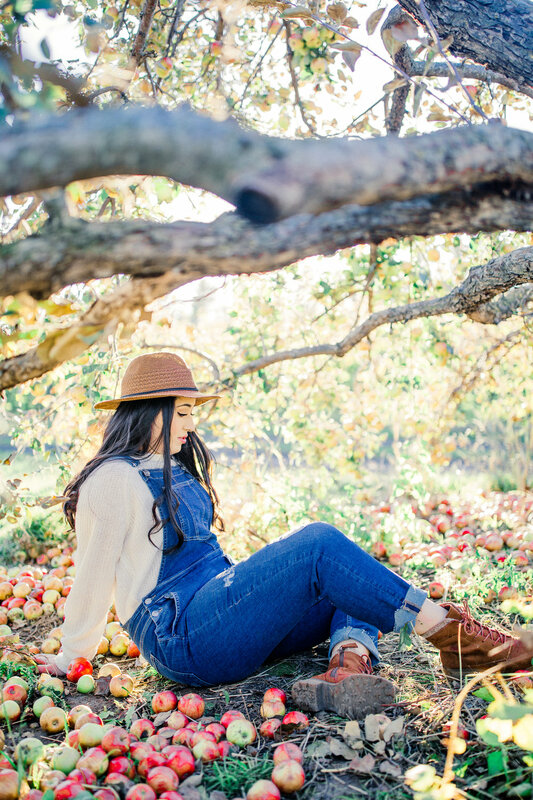 We landed on Aamodt’s Apple Orchard a short 30 minute drive outside of Minneapolis in Stillwater for her senior photos. The light was golden, and we were buzzing around the apple trees taking advantage of the beautiful setting, awesome outfit choice, and gorgeous light that this Autumn day brought to Kelly’s senior shoot!